"General election dismissed as solution to council vacancies"
SIX NATIONS - The two recent band council vacancies left by the passing of District 5 Councillor John Peters Sunday and the removal of District 3 Councillor Les Sowden last week will not be met with an early general election call. Although council has not yet committed to filling the positions before the next scheduled general election in November, 2001, Six Nations Elected Chief Wellington Staats says a by-election, not an early general election, would determine Peters' and Sowden's successors on council. "If there is going to be an election, and I'm saying if, then it would be a by-election," says Staats. Under Section 10 of the Six Nations Elections Code, band council can call a by-election or an early general election to fill council vacancies occurring more than four months before the next scheduled election. The section also requires council to inform the community of its decision to have a by-election or general election within five business days of the vacancy. The five-day period, in Sowden's case, expired yesterday. 90 days. The 90 day period for Sowden, who was charged Sept. 4 with four indictable offences in connection with two alleged assaults in August, had expired. Although he has stated his preference for holding a by-election over a general election, Staats has refused to answer if a by-election will, in fact, be held. "We're informing the community that if an election becomes necessary, it will be a by-election." The chief says he is not yet in a position to confirm that a by-election will take place, as there is a possibility Sowden will contest his recent removal from council. "The reason I have to say that is because I understand that Mr. Sowden has got a lawyer and all these other kind of things, so I don't know what kind of complications there might be," says Staats. "I really don't know what Mr. Sowden plans to do, but if he decides he's going to contest the relief of his duties by council, then a by-election could be a while off." 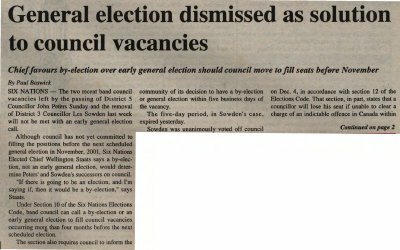 While no provision in the Elections Code addresses how an ousted councillor can contest his removal, Staats says Sowden could "always go through the courts" to dispute his dismissal. Calls placed to Sowden by the Teka have not been returned. Last week's decision to dismiss Sowden, while unanimous, was made grudgingly, says Staats. "I think it's very unfortunate, and I'm not very happy with it, to be quite truthful," he says. "But nevertheless, that's the rule. I have to do things I'm not happy with a lot of times." Aggravating the difficulty of the decision, says Staats, was not knowing which section of the Elections Code council should adhere to. One section, Section 11, calls for a vacancy of office in Canada. Section 12 also calls for the removal of a councillor upon conviction, and also outlines the 90 day period in which charges must be cleared. "Council was wrestling with which section we were going to use," says Staats. "That was the real problem we were having. This section here says you've got to wait until you're convicted, while this other section here says 90 days." While conceding to flaws within the Elections Code, Staats says such problems are an inherent part of any electoral policy. "The United States has had 200 years," says States, citing the political confusion which has arisen from last month's undecided presidential election. "We shouldn't be condemned in our first round." Staats says Sowden's responsibilities on council, which included chairing the Six Nations Parks and Recreation Committee and membership on the Lands/Membership and Economic Development committees, have not yet been reassigned. "That hasn't been done yet because there's been no council meeting yet." Staats says he can't anticipate when council will decide if a by-election will be called. "We'll have to see how it all works out." That decision, he adds, could also be affected by the recent passing of John Peterson. "Now we have another possible by-election to be considered, but I don't think this is the time to be talking about that now." Peterson, John ; Sowden, Les ; Staats, Chief Wellington. Six Nations Elected Band Council ; Six Nations Parks and Recreation Committee ; Six Nations Lands and Membership Committee ; Six Nations Economic Development Committee.